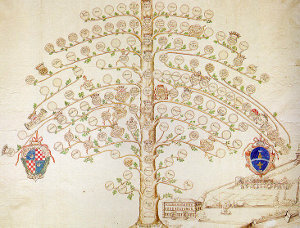 If you search your ancestors in San Massimo, Molise, info about your Italian family are stored in the City Office archives or at the parishes. In towns and villages of Molise and in Campobasso province registry offices were established in early 1800: it means that you could find information in San Massimo registrar as of that date. So, if your ancestors were in San Massimo in the nineteenth or twentieth century, then you could try to contact the City Office of San Massimo to know more. Before to start your genealogy research in San Massimo, we suggest you to read our tips for your search . They are useful to search in Molise and in San Massimo too. 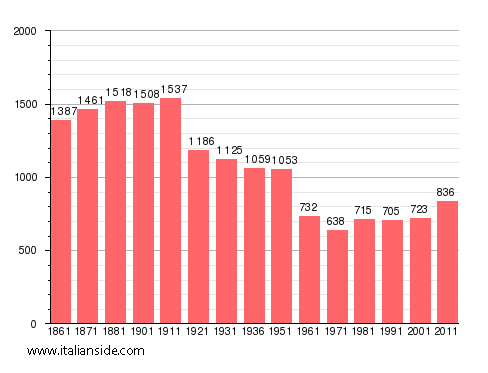 Next picture shows the demographic trends in San Massimo from the Italian Unification (1861) an important info to understand how many people lived there in the past. It could be important to know if the last name you are investigating is a frequent surname in San Massimo. As more your surname is common in San Massimo, as more it could be difficult to find the right info about your ancestors in San Massimo archives if you have not exact dates. Battista, Calabrese, Caruso, Ciocca, D’Alessandro, D’Amico, D’Angelo, D’Aversa, De Santis, Di Biase, Di Domenico, Di Iorio, Di Paolo, Di Stefano, D’Onofrio, Fanelli, Felice, Florio, Greco, Iannetta, Lombardi, Mancini, Manes, Manocchio, Marinelli, Marino, Martino, Mastrangelo, Mignogna, Moffa, Niro, Occhionero, Palladino, Palmieri, Panichella, Pasquale, Perrella, Petrucci, Petti, Romano, Rossi, Russo, Salvatore, Santoro, Spina, Testa, Trivisonno, Venditti. Church archives in Campobasso province may instead contain even older information, but they are far less accessible from abroad (and almost impossible by email). Then,parishes send information not easily. If you have the opportunity to visit San Massimo and Campobasso province, you could plan to investigate churches’ archives by yourself, but from abroad is very difficult to obtain any result unless you find a reliable local help. Another important source of information is the “Archivio di Stato” (National archive) in Campobasso. If your research is in a dead end and you need professional help from our local Italian genealogists write to sanmassimo@italianside.com our expert in San Massimo area will study your request and will reply to you with a research plan and a quote. I am looking for a family connection to Crispino Farrace who traveled to US in 1921. He was born in San Massimo in 1897. My great grandmother Carolina Maselli last place of residence listed on ship manifest was San Massimo. she and her two sons boarded the ship Roma in 1906 out of Naples. her sons names were: Salvatore Piccirilli born 1897 and Giovanni Piccirilli born 1903. Im looking for any records that may be available. Have been looking for more information on my De Luca relatives in San Massimo. I know all their names and some birthdays. Salvatore DeLuca (my great great grandfather) married Maria Fiorilli . Some of Salvatore’s children ended up in Canada and Brazil. If you would like to start a research in San Massimo please send your request to sanmassimo@italianside.com.